A splendid characteristic of Schubert’s was his interest and pleasure in all the successful creations of other people. He did not know what it meant to be envious and he by no means overrated himself … Although absolutely German in tendency, he by no means agreed with the abuse of Italian music, and especially of Rossini’s operas, which was usual at that time. The Barbiere di Sevilla he found delightful and he was enchanted by the third act of Otello; in the operas given at that time … Lablache’s singing captivated him. The latter took a great liking to Schubert, and once when the four-part song, Der Gondelfahrer, was sung at a party he liked it so much that he asked for it to be repeated and then sang the second bass part himself. Lablache probably met Schubert at the home of Raphael Kiesewetter. These three songs (Schubert’s last in Italian) were certainly dedicated to Lablache, but it is also likely that they were written especially for him. It is also possible that he sang them some time before they appeared in print as Op 83, and that he played some part in the correction of the Italian accentuation before the work went to the printer. The songs were published simultaneously with a German text; this is still to be found in the Peters Edition where the songs are listed in Volume 6 under their German titles Die Macht der Augen, Der getäuschte Verräther, and Die Art ein Weib zu nehmen. The translator’s name is not known; Walter Dürr points out that it is unlikely to have been Schubert’s erstwhile collaborator Craigher de Jachelutta; Craigher was a native Italian speaker and would almost certainly have corrected the mistakes in Schubert’s Italian prosody before providing the German translation. In fact the corrections were made only after the translation was added. Opus 83 as a whole is typical of the publications put out by Haslinger who was ever aware of musical politics and market forces. He must have found these pieces ideal for his purposes: the dedicatee was a celebrity, songs in the Italian language were all the rage, and the style of the music was accessible. At least one critic, G W Fink of the Leipzig Allgemeine Musikalische Zeitung, agreed. In an enthusiastic notice (30 January 1828) he refers to Schubert as ‘the generally lauded and favoured composer’ and that all three songs are ‘well suited to social entertainments’. He predicts that ‘Signor Luigi Lablache, to whom these three numbers are dedicated, is sure to make a furore with them’. The composer Heinrich Marschner, on the threshold of his own success as an opera composer, was less impressed. Writing in the Berlin Allgemeine Musikalische Zeitung (19 March 1828) he criticised the songs for being neither fish nor fowl – not sufficiently colourful and vital enough to be truly Italian, not expressive enough to be real German Lieder. ‘The flow of his melodies is too intermittent, too heavy-handed; it is no glowing lava stream but only a somewhat cold, murmuring northern brooklet … Herr Schubert has thus not yet succeeded with these songs in bringing about an alliance, however desirable, between German and Italian music.’ Of course Schubert had no such grandiose aim, and the listener of today is able to delight in the mixture of styles that is the inevitable result of such a work. We can only agree with Capell: ‘Schubert is here working outside his natural style, but he does it uncommonly well’. Of all Schubert’s Italian settings this music sounds the most Schubertian. This is not to denigrate the charm of La pastorella in either the solo (Volume 9) or choral version (Volume 34); and the fire and passion of the aria from Didone abbandonata is as fine a piece of drama as the musical epistle Herrn Josef von Spaun is a rollicking piece of Italian pastiche. It is just that this particular cavatina radiates that extraordinary sense of wellbeing that suggests (appropriately in this case) a twinkling eye and tapping foot. In the introduction the right hand’s repeated quavers have something of Der Einsame about them, but it is the placing of the left-hand octaves (on the first and last quaver of each bar) which cheekily enlivens the music and transforms what could have been very banal in other hands into Schubertian gold. This music makes us smile, but it is far from being comic; it is both beautiful and raffish, and we somehow know that someone (Schubert) is quietly having fun at someone else’s expense (Rossini and the whole world of Italian opera) without having a malicious bone in his body. To write music that pulls both leg and heartstring is an utterly Schubertian achievement. There is something irresistibly buffo about this music, but the moderate pulse of the kindly Allegretto betokens the gallantry and sagacity of a gentleman. The piano dynamics of the first page suggest a quietly flowing Don (Pasquale or Quixote) or a retired Hidalgo. The music is so downright genial that we can only assume that this song, like much of the music Schubert wrote with Vogl in mind, amounts to a portrait of its intended singer. If Luigi Lablache was really like his music it is little wonder that Schubert got on with him, and that he was said to have liked Schubert in return. The entire first verse pooters amiably between tonic (C major) and dominant, but is a miracle of charm where every unexceptional change of chord is placed with consummate elegance. The voice blossoms into emollient semiquavers at ‘mi sento cangiar’, a foretaste of what is to come in the third musical verse when the composer re-works the first four lines of the poem. These acciaccatura-led roulades are once again reminiscent of Der Einsame. In that song we see the outline of the flickering flame in the hearth; in L’incanto degli occhi the same figuration is prompted by similar imagery – the flashing of a lover’s eyes. A new mood emerges for lines five to ten of the poem: to depict the idea of daring (‘Ardir m’inspirate’) the music moves into the Neapolitan key of A flat major, and the piano dynamic gives way to a more dramatic forte. Schubert lovingly recycles all the Italian clichés: sudden changes of dynamic, leaps between the bottom and top of the voice, the use of pathos which changes easily, and shamelessly, to equally opportunistic flirtation. But as this is not real Italian music there is a refinement of modulation which is not to be found in Rossini miniatures – for example the change from G major to B major, leading to the dominant of that key (F sharp major) which, in turn, deliciously slides up a semitone to a chord of G7 under the first repeat of the words ‘Da voi, cari lumi’; this acts as an irresistible, and beautifully timed, up-beat to the return of the tonic. The song is really ABA in structure, where the repeat of A is an embroidered variation of what we have heard in the first section. There is many an old-fashioned set of variations by composers like Paisiello and Mayr which opens with a theme unadorned and progresses with ever quicker and more exacting divisions. The rondo finale of Rossini’s La Cenerentola comes to mind. Added to this there is a coda to the Italian manner born which allows the music to trail away to a whisper. Schubert puts Lablache through his paces in a rather more relaxed way than Rossini, and this aria is much less glittering than the Italianate virtuoso music he himself wrote for Anna Milder at the end of Der Hirt auf dem Felsen – a work which was designed as a show-off piece. The low and rumbling coloratura writing of L’incanto degli occhi, when well done, sounds less like one of those exacting bel canto roles, more like the purring of a well-tuned Rolls. And all the time the piano continues with its unchanging quavers and its mock-lugubrious left-hand interjections, an accompaniment which could be vamped by almost any singing teacher but at the same time one of the wittiest that Schubert ever wrote. Parody, pastiche, call it what you will, this work is no put-down; it ranks with Liszt’s Petrarch Sonnets and Britten’s Sonnets of Michelangelo as an affectionate stylisation. And like those works which pay inspired homage to Italy, it distils the country’s musical manner albeit with the exaggeration of a foreigner’s bemused observation. 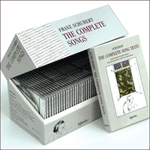 All this, and a bonus: Schubert remains his inimitable, lovable self throughout. The text is the ‘Aria di Licinio’ from Act 2 Scene 5 of Metastasio’s Attilio Regolo (1740). The story is set in ancient Rome at the time of the Carthaginian wars. The hero, the Roman consul Regulus who eventually gives up his life by returning to Carthage to face a death sentence, has a daughter Attilia. In the second act of the opera she plots to save her father’s life with the help of her beloved Licinio who is a slave to her every wish. Io sento tutto inondarmi il seno di gelido sudor! Fuggasi, ah quale? Qual’ è la via? Chi me l’addita? Oh Dio! che ascoltai? Che m’avvenne? Oh Dio! che ascoltai? Qual notte profonda d’orror mi circonda! Che larve funeste, che smanie son queste! Che fiero spavento mi sento nel sen! I feel a cold sweat upon my brow! I must flee; but whither? Where is the way? Who will show it to me? O God, what do I hear? What is happening to me? O God, what do I hear? The perfidious earth quakes and trembles! The deep night surrounds me with horror! What baleful creatures, what furies are these? What raging terror I feel in my breast! Having allowed Lablache a self-portrait as a latter-day Don Quixote, it is time to have him don another, more formidable, costume, more attuned to his success as the father in Paer’s Agnese which included a mad-scene. It is as well to note, however, that Agnese was an opera semiseria, and the participation of a buffo bass in a mad-scene of this period shows that, like almost all male madness depicted in eighteenth-century opera, the role had a strong element of comedy – as Edward Holmes’s recount makes clear. There is a similar ambiguity in Schubert’s Il traditor deluso: it is full of dramatic postures but it is ultimately not serious, a certain ridiculousness being built into the music. As such, it is great fun to sing and play at the same time as being technically demanding. For all its superficially impressive bluster it is not as musically rich as the preceding song which has a Mozartian grace. The piece begins with a mighty recitativo stromentato. The key is E minor and the piano’s left-hand tremolo suggests strings scrubbing away in great agitation. Over this background a dotted rhythm motif in right-hand octaves appears, rich in portent and absurdly melodramatic; for a moment it even sounds Wagnerian. This appears twice (once in the trombone register of the pianist’s left hand) before a modulation to B minor which is designed to twist the tension to a higher point. The motif appears twice in this key as the music works itself up to a suitable pitch of panic (semiquaver oscillations, shuddering dotted rhythms) to reflect the disorientation of the character. The vocal line is dominated by short gasps and exclamations in a highly dramatic manner. The aria (marked ‘Allegro molto’) is in E minor and alla breve. The main feature of the opening vocal melody is its unflinching insistence on a syncopation which throws the emphasis of nearly every bar on to the second crotchet. This characteristically Italian device is used so insistently as to make fun of it. The accompaniment swirls with arpeggio figurations; at the first repeat of ‘Ah l’aria d’intorno’ this changes to a series of right-hand chromatic scales potentially hazardous to the pianist. In the hot seat, this seems much less fun, as are various other passages in the song which call for darting dexterity and a dab hand at split octaves. At ‘Qual notte profonda d’orror mi circonda!’ the vocal line smoothes out to ominous minims and semibreves as the piano shivers in the background; repeats of these words prompt other reactions such as sudden vocal leaps from the singer, and the pitter-pat of awestruck quavers between the hands from the pianist, At ‘Che fiero spavento’ chromatic phrases dig into the bottom of the bass stave in suitable woebegone desperation. This leads to the da capo recapitulation of the aria and a return of those jagged syncopated phrases. And so it goes on, with Schubert using and re-using a short Italian verse, spinning it out and repeating it so that it no longer matters what it means. Once the listener has got the gist of what is being said he is free to concentrate on assessing the vocal pyrotechnics. This remains typical of some, though not all, Italian audiences. Schubert took a considerable amount of trouble here in both the vocal and pianistic detail. Of the three songs of this opus this is the one that pleased Marschner the best, probably because it works itself into a passable frenzy. As such it is a worthy companion to other tempestuous Italian arias by Schubert (Son fra l’onde, the closing sections of both Didone abbandonata and Herrn Josef von Spaun). But it engages the Schubertian’s amused respect more, perhaps, than his affection. The text is the ‘Aria di Atalia’ from Act 2 of Metastasio’s Gioas, Rè di Juda. It does not seem to have concerned Schubert in the least (and why should it?) that in the libretto’s original context the murderess and usurper Athaliah (grandmother of Joash who eventually regains his rightful throne as King of Judah) is a female character. Sò ben perchè lo fò. Del mio trovar non sò. È vero, si o nò? Courage, let’s get it over with. I know very well why I do it. I do it to pay my debts. I take her for the money. The last sentence of this extract places this incident in 1821/22, preceding Schubert’s infection. But the anecdote, if true, raises more questions than it answers: why did Schober’s words make the composer angry? Why could no woman love him? Auguste Grünwedel was a real person, apparently beautiful, who passed briefly though the Schubertians orbit, but nothing further is known of her, certainly in relation to Schubert. It might have been a very good idea, all being equal, for the composer to have married her in 1822; his finances, thanks to Sonnleithner’s intervention with the publishers, were on a solid footing, and ‘Gusti’ was well-to-do in her own right. By 1827 the subject of marriage was so far in the past that the composer could countenance this cynical text without distress or distaste. The razor-sharp shade of Rossini’s barber hovers over this music, an indication of how well Schubert loved the opera as the ever reliable Spaun informs us. Without the supporting context of an opera plot, as well as scintillating orchestration, Schubert is unable to work up the sparkle of a Rossini at his best; but the music, even if it is not quite the Largo al factotum, is jolly and effective. The key is C major, and the bustling ‘Allegro non troppo’ in 6/8 creates an air of Italian busyness in just the right stirring manner to suggest a thickening plot. A contemporary lied unexpectedly comes to mind: the Rochlitz setting Alinde. In that song the singer’s search for Alinde seems similar to this search for a wife. This is most strongly to be noticed in the acciaccatura ornamentation of the piano writing in a similarly playful 6/8. The poem’s first three verses are accompanied by genial triplet configurations and a wide-ranging use of modulation – not perhaps as adventurous as if the style had been Schubert’s own, but at least as inventive as is to be found in Rossini’s music. The shifts of tonality are always towards the flat keys, and include the same move into the Neapolitan key of A flat major that we encountered in L’incanto degli occhi. Most of this music is governed by the ceaseless movement of triplets, but at the beginning of the fourth verse (‘Si prende per affetto’) semiquavers begin to make a teasing appearance in the accompaniment. This speeding-up of the note values in various stages is a typical trick for an Italian finale. At the final appearance of ‘un poco di sposina’ the vocal line is doubled with the piano to suggest guile and intrigue. As is often the case with Italian texts of this era it is the concluding verse of the poem (used over and over again in whatever repeats are necessary) which is given over to a rousing finale. For these words of resolve the music moves into ‘Allegro vivace’ in common time. (Performers who attempt this music in too brisk an alla breve will have to pay the unplayable price on the next page when the music moves into semiquavers.) It is here perhaps that the melody fails to deliver that extra lift that we encounter in the great Rossini perorations. Its liveliness of effect depends more on the pianist, who suddenly discovers at the end of the piece a series of challenges of which there is no clue in the opening pages. Genial bouncing triplets are replaced by whirlwind roulades of semiquavers, mainly in C major but also encompassing chromatic shifts; not all of these lie easily under the fingers. Schubert makes of this music something diabolical as if marrying for money were one of the most dastardly things that could ever happen; his music in the song’s final pages suggests a villain capable of murder at the very least. The vivacious postlude in semiquavers, an octave apart between the hands, is unlike anything else in the songs. It provides a rousing end to a work which gives delight to the Schubertian mainly because it is by Schubert and it is wonderful to see our heroes in off-duty guise. If the promise of L’incanto degli occhi is not quite fulfilled in the second and third songs of the set it is only because the great is always the enemy of the good. 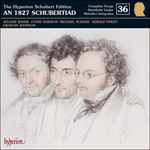 And it is usually the case that the tender Schubert always leaves a more lingering impression on the listener than when he is in barnstorming mood. The text of this work is not to be found in Metastasio’s work and remains one of the many small Schubertian mysteries still to be solved. The words almost certainly come from an opera by a minor composer which had been sung by Lablache earlier in his career and which he probably suggested that Schubert might re-use.